Bev Kauffeldt puts on her personal protective equipment while serving in Liberia earlier this summer. A staff member explains it was the right thing for her to do. 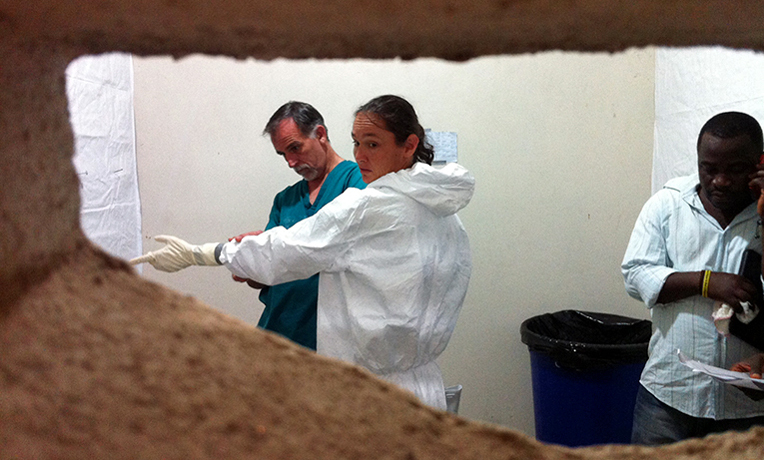 Bev Kauffeldt recently returned to Liberia to serve as the Ebola Response Lead for several weeks. She is married to Kendell, who serves as the Liberia Country Director. They are currently working from North America and desire to return home one day with their two sons. *Warning: Reading this blog may make you feel uncomfortable—I was uncomfortable writing it—and that’s OK. I can’t tell you how many times I have been asked this question. And the rest of our international Ebola response team serving in Liberia could tell the same story. It is hard to respond. How do you put into words what you know is right? Many times my response was “How can I not go? It’s my home.” But it goes deeper than that. It’s more than just the fact that we have lived and served with Samaritan’s Purse in Liberia since January 2005. It’s more than that the only house we call “ours” is a little cement rectangle on the beach of a missionary compound outside Monrovia. It’s more than that Liberia is the only place our sons have ever lived…it’s way more. When we left at the end of July (following Kent Brantly’s diagnosis with Ebola and a deteriorating security situation at our base), I wasn’t sure if I ever would be back to Liberia. In all honesty I wasn’t sure when I would ever be ready to go back. 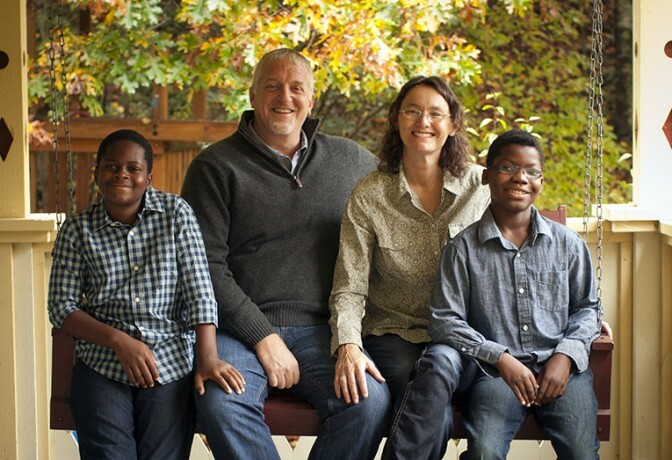 Bev, Kendell, and their two sons, Felix (at left) and Isaac (at right). This photo was taken just before Bev left for Liberia this fall. When I got back to North America I was watching the news on the Internet trying to get information on what was happening in Liberia. My heart broke seeing bodies lying on the same road that I had traveled a million times. Liberia was on my mind all the time. 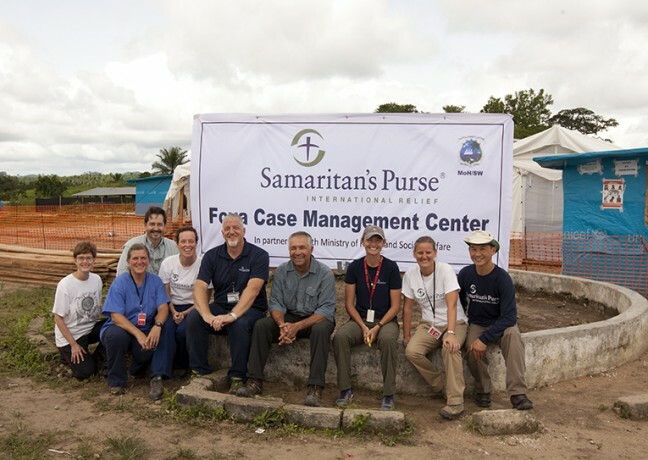 Samaritan’s Purse invited us all to a debriefing time in early September. And after an amazing time of counsel, sharing, prayer and worship with all of those that fought with us, I could sense that God was working on my heart and preparing me to go back. The next morning many tears flowed as goodbyes and the last hugs I have had since were given. I am not going to say I was at “peace” or that I felt great about going back. What I will say is that God gave me the strength to put one foot in front of the other and move forward in His direction. 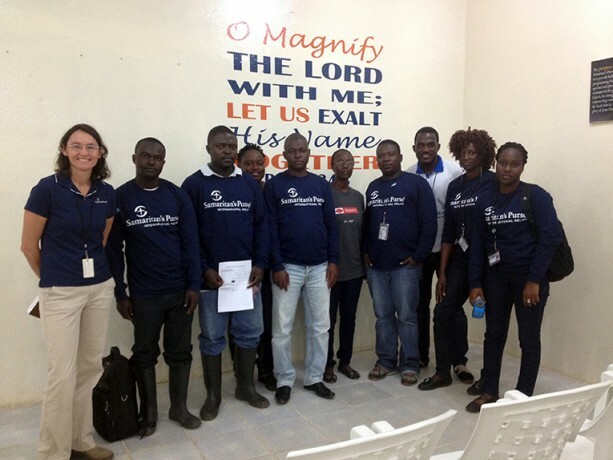 Bev continued to work with our national staff in Liberia when she returned for several weeks this fall. Common sense. That’s exactly how I felt. It just made sense to go back to where God wanted me to be. If I really believed and proclaimed that Jesus was my life—well it was time to live it out. If I really say that my goal in life is to know and obey Christ—well, Bev, prove it. Are you willing to obey and to glorify Christ in life and death? Listen, I am far from living this out trust me. Following Christ is risky business, it comes at a great cost. Just ask Paul, all of the disciples, or consider the numbers of Christians persecuted for their faith around the world today. I went back to Liberia where I can freely proclaim Christ, even in the midst of Ebola. It does not seem that risky when you consider our brothers and sisters in Iraq and Syria. I am pretty sure if you asked them “Why do you go back? Why are you there?” their answer would be the same as mine. It’s just common sense. If you were to ask any of our international staff who is in Liberia or wants to go back, I think they all would say their desire is to be with our Samaritan’s Purse family, our national coworkers, and do the work God wants us to do. It’s who we are; it just makes sense. In fact, I have a very hard time understanding why people, specifically Christians, question why we are going back. When we are living for ourselves, we want to control our environment and try and keep it as safe and secure as we can. But we can’t! So why live thinking you can? When Jesus sent out His disciples in Matthew 10 He gives a pretty good indication what it means to follow Him. The key is verse 39: “Whoever finds his life will lose it, and whoever loses his life for MY sake will find it” (NLT). I, along with my fellow Samaritan’s Purse family, have found our lives in Christ. Earlier this summer, Bev, Kendell, and a number of our staff paused for a moment in front of our Ebola Case Management Center in Foya. They are just a few of the courageous men and women who have served in Liberia with Samaritan’s Purse during the Ebola crisis. Is it easy? No. Is it pain free? No. Does it come at a sacrifice? Always. I can’t explain to you the joy and the I-know- that-I-am-doing-the-right-thing-even-if-the-world-thinks-I-am-not feeling you can have when you live like this. To those reading who understand why I went back, and I will again, you get it. To those who still are not sure—I assure it’s OK to risk for Christ. Why? Because He risked everything for us on the Cross to be sure that when we do risk for Him, even if it costs us everything, He is there on the other side with open arms to welcome us home as good and faithful servants. Finally, I want to thank all of those who are praying for our staff. Your prayers are a big reason why we are able to go back—we are covered by your prayers of safety, strength and wisdom. The Father smiles down on you when you bring His children to the throne. Thank you.